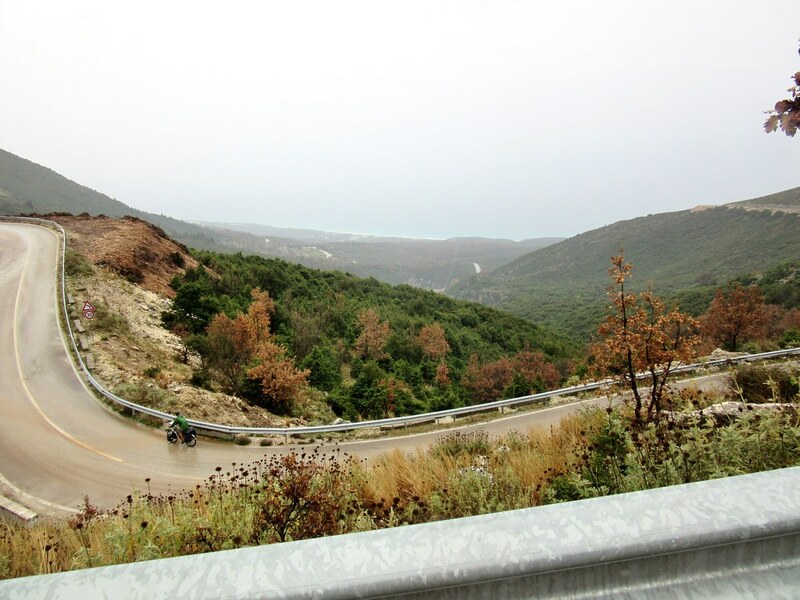 The coast road north of Sarande immediately started climbing, and this set the tone for the next two days. 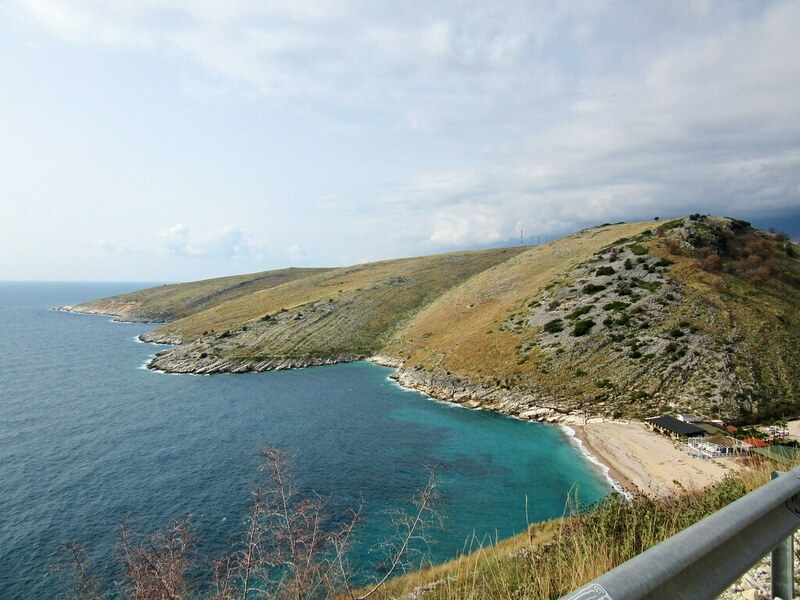 As with most of the other beautiful coast roads we’ve ridden, we had to earn the good views. We headed slightly inland for the first couple of hours with the signs showing a 10% gradient. But the signs only ever said 10%, they didn’t seem to have any other numbers. In reality some were less, but a lot were more! 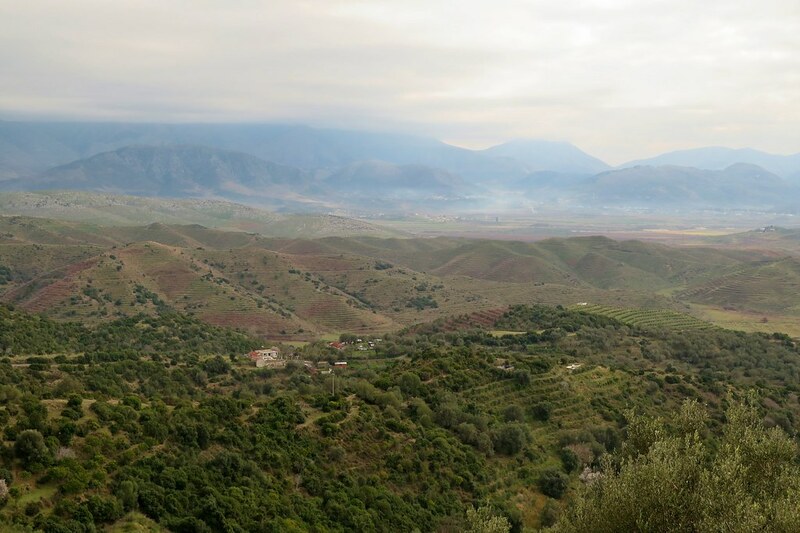 Most of the land was dedicated to orchards, oranges I think, with the mountains in the distance hidden in the clouds. 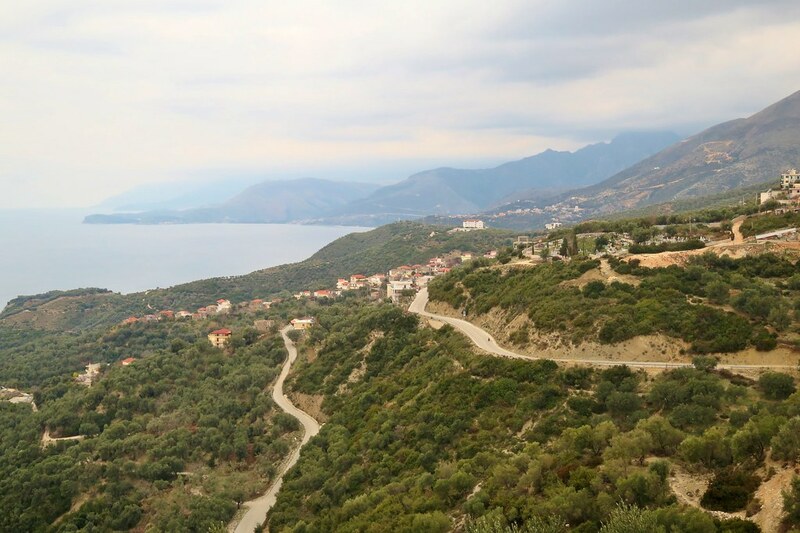 We reached a few hundred metres altitude and then had an equally steep downhill taking us back down to the sea. Just before lunchtime, the speedo ticked over 5,000km, giving us a grand total of 19,000km for the trip so far. When we set off, we made the very rough estimate that we’d do 20k, but it looks now like we’ll pass that by some way. Any guesses for what our final total will be? (Winner gets a signed pair of cycling gloves!) We pulled in to a restaurant overlooking Porto Palermo castle for a celebratory lunch and a beer. The prices are very reasonable here in Albania, so restaurant lunches are still well within budget. We were up and down between zero and 350 metres a few times through the afternoon. It’s a beautiful coastline and really fun riding. There’s very little traffic and we’re quite confident at speed now, so we’ve been really flying on some of the steep downs, enjoying the smooth curves. Every few minutes of exhilaration costs us a lot longer in slow climbing in granny gear, but its worth it, even if we do finish the day with very tired legs. 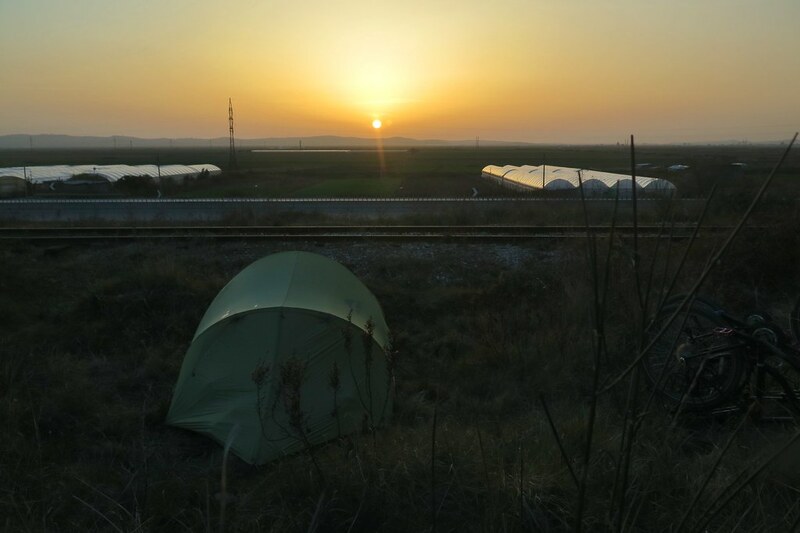 There’s not much flat land to pitch the tent on, but we found an olive grove where we hid away from the road and had a peaceful night. We had another big day of climbing ahead. 1,000 metres isn’t much compared to some of the passes we crossed in Central Asia, but the road looked very intimidating, zig zagging its way up to the snowline above us. We both put an earphone in for some musical encouragement and settled in to our natural climbing speeds – Clare’s significantly faster than mine. We quickly gained altitude, and it was actually pretty enjoyable, even with the rain that started falling. 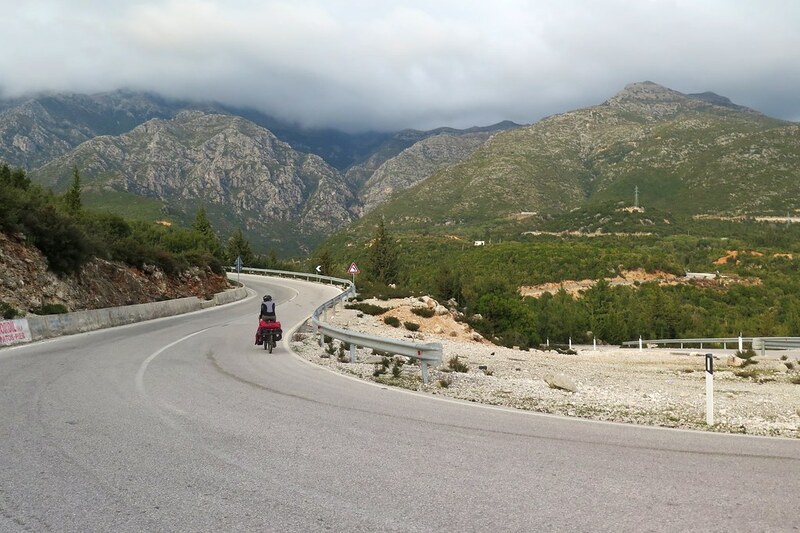 The switchbacks kept the gradient manageable (signposted as 10%) so it was just a case of turning the pedals and remembering to look at the view. 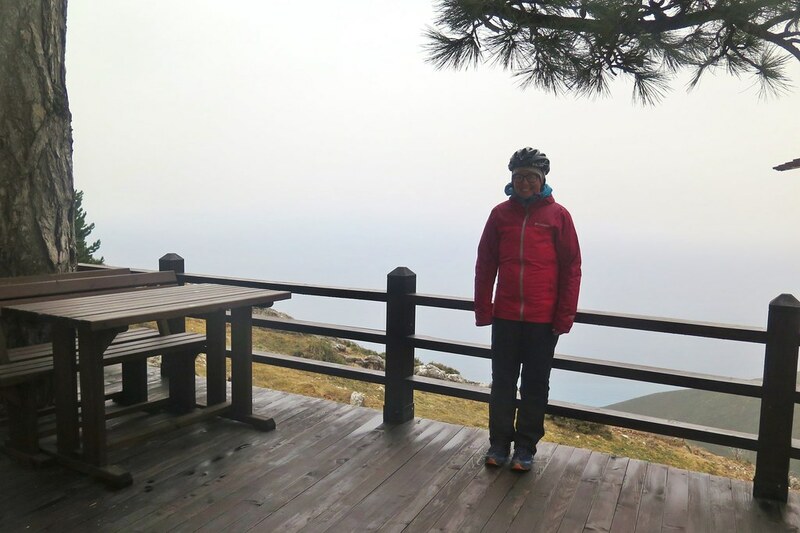 The top was just in the cloud, so we were denied a scenic photo from the pass, but we dived in to the restaurant up there for a nice warm bowl of soup. 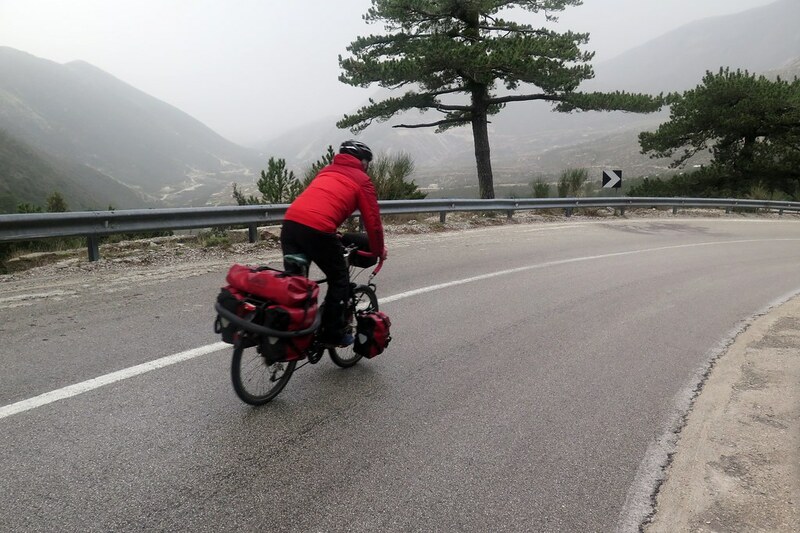 We were soaked through from sweat and the rain, so we changed into a dry base layer and layered up for the cold downhill. We soon were very grateful to be travelling in this direction. The road was much steeper (10%) this way, which meant we were hard on the brakes for a lot of the initial descent, especially with the wet road. A little lower down and out of the trees, we were hit with an incredibly strong wind. A warm, katabatic wind (I think?) blowing down the hillside pushing us along at about 50km/h even once the gradient mellowed out. Coming up the pass in the opposite direction would’ve been tough. 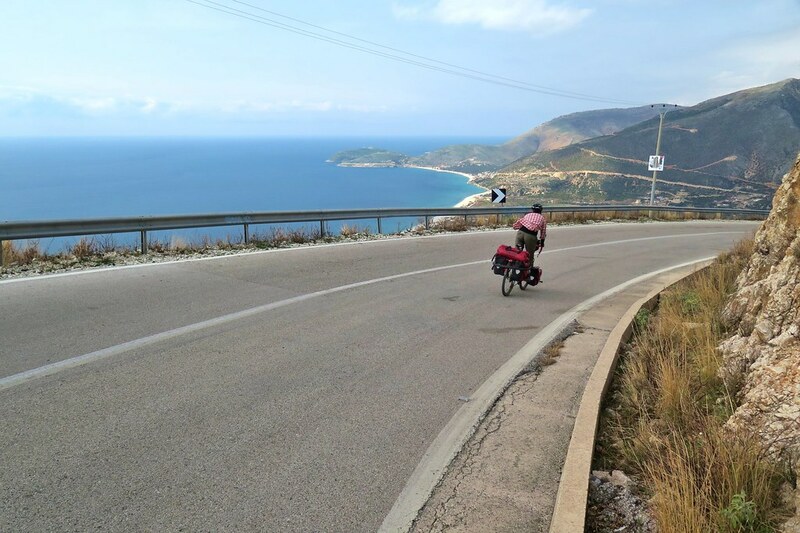 We covered some good distance through the afternoon, getting us into the coast town of Vlore. We planned to have a rest day here as heavier rain was forecast. The whole town seemed like it was a construction site. The main road was being dug up, so the first hotel we looked at had no running water (not ideal) and no wifi (not acceptable) so we decided to move on. We found a cheap place on booking.com and made our way over there. The neighbourhood felt more like some of the small towns we passed through in the ‘stans than somewhere in Europe. 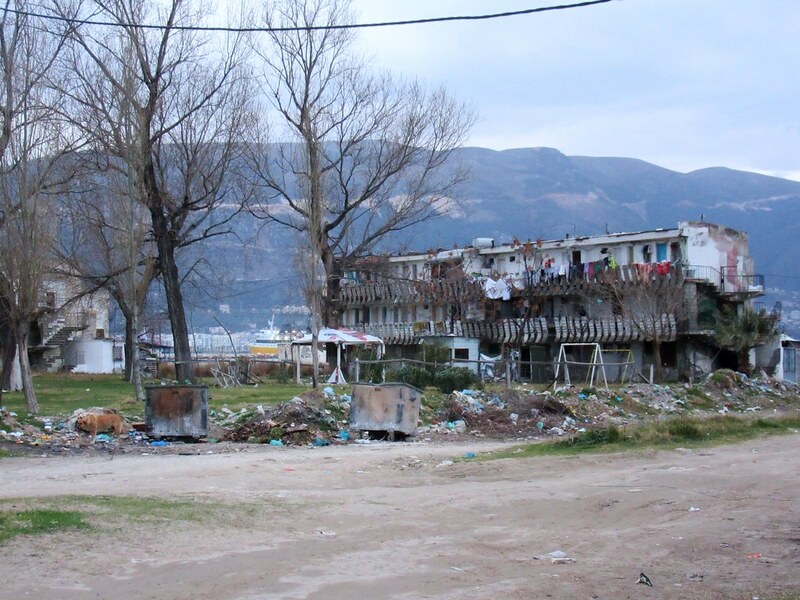 A reminder that Albania is one of the least developed countries in this part of the world. The welcome (and the shower) was warm once we arrived and we had a good day off, mostly spent doing some laundry and sheltering from the rain. 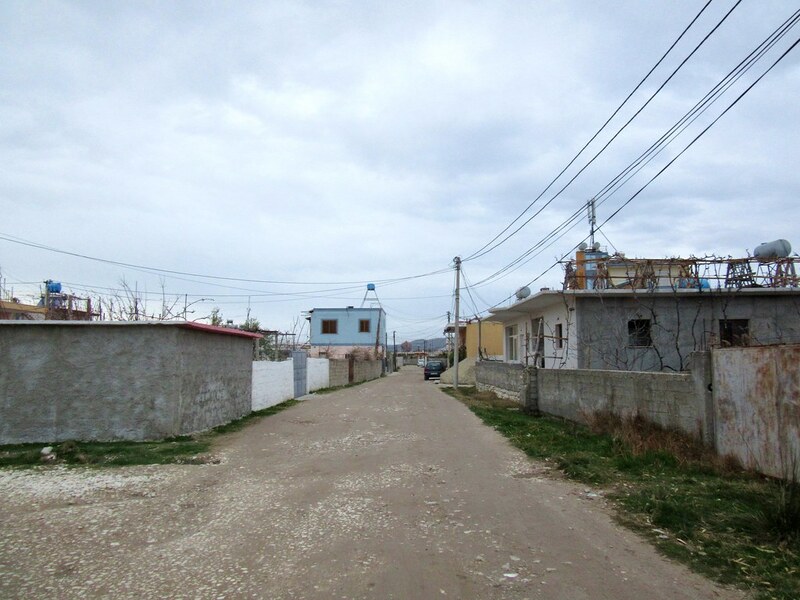 The impression we got of Vlore based on the area we saw might not have been fair. 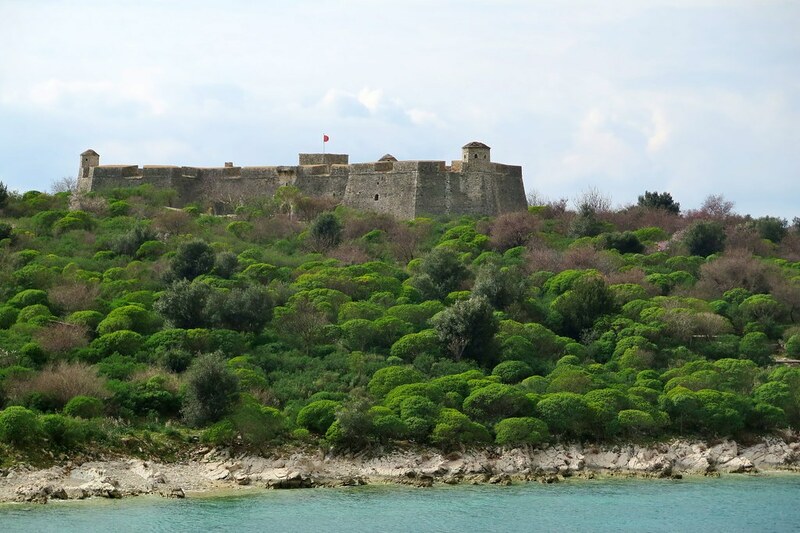 The town is receiving a good amount of investment and is being slowly improved and modernised. 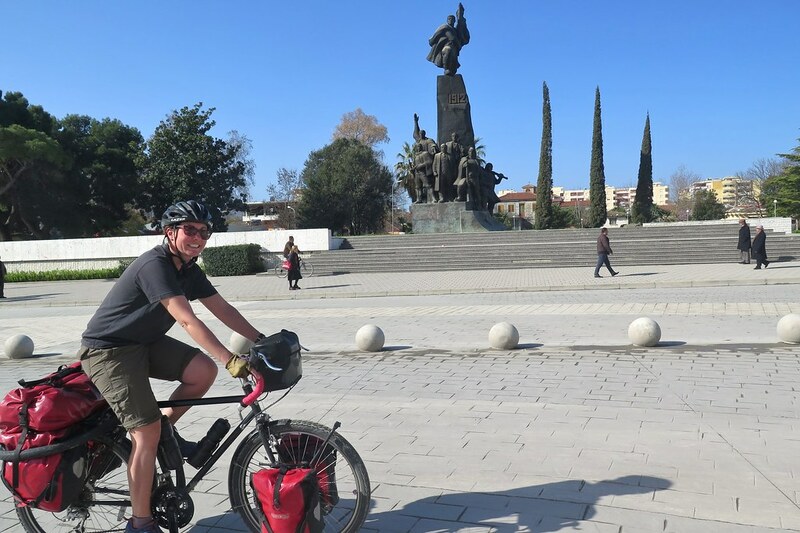 Riding out of town, we passed through some really nice public spaces and a much more vibrant area than the port zone that we came in through. The weather had improved significantly and we had blue skies and soaring temperatures through the day. Unfortunately the road wasn’t particularly interesting, we joined a dual carriageway that is the main road up to the capital. There wasn’t much of a shoulder, and there was a line of cats-eyes that meant we had to stick on the white line to avoid a very bumpy ride. The traffic built up and the driving was fast and a bit crazy, so we kept our eyes on the road, not on the countryside around us. Finding a camp spot took a while as most of the land was built on or farmed. After a few failed attempts, we followed a path away from the road and over the railway line to find a small flat area that looked like a good bet. It was right next to the track, but it didn’t look like it was in use, so we pitched the tent and hoped for the best. Luckily there weren’t any trains during the night. It was more of the same to start with the next day. 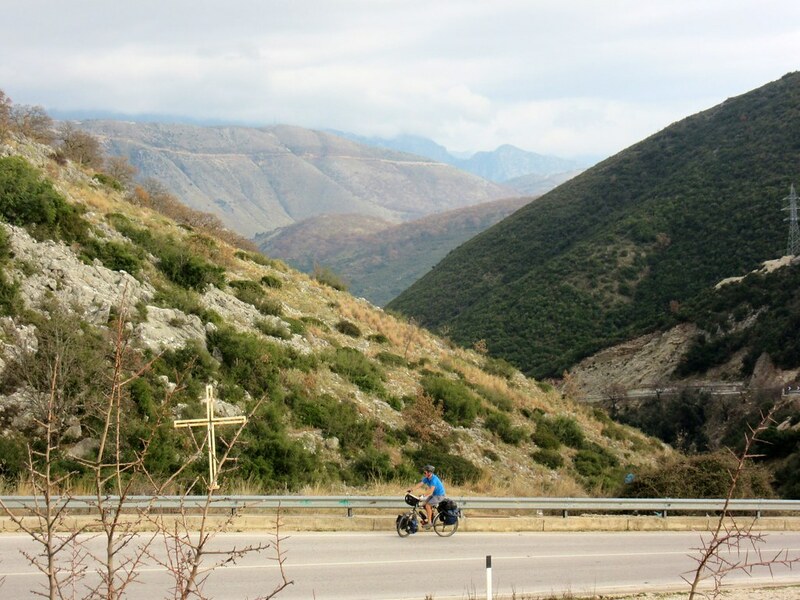 We followed the highway for a couple of hours, racking up some quick early distance, then we turned off to try and cut the corner and shave about 20km off the ride into Tirana. 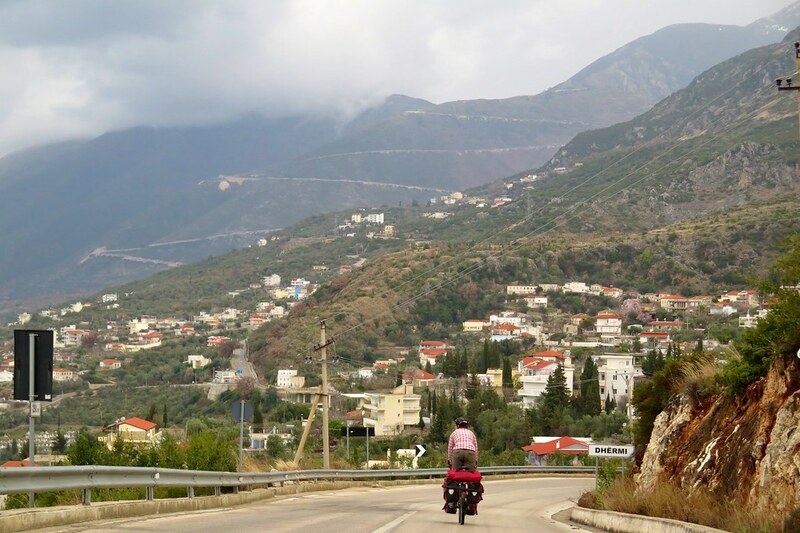 It looked like we’d found a winner, a quiet road that took us up into the hills with great views back over the sea. We stopped for a tea break next to one of the many bunkers that are everywhere in the countryside here, feeling very smug to have found a shortcut. But, a couple of corners further on, the road deteriorated to a muddy dirt track and ended up in a field. There was nowhere else for us to go, so we retraced our steps back to the main road, resigned to a longer day than we’d hoped for. Later on, we did take a slightly smaller road which did save us a little bit of distance, but the surface was rough and bumpy. 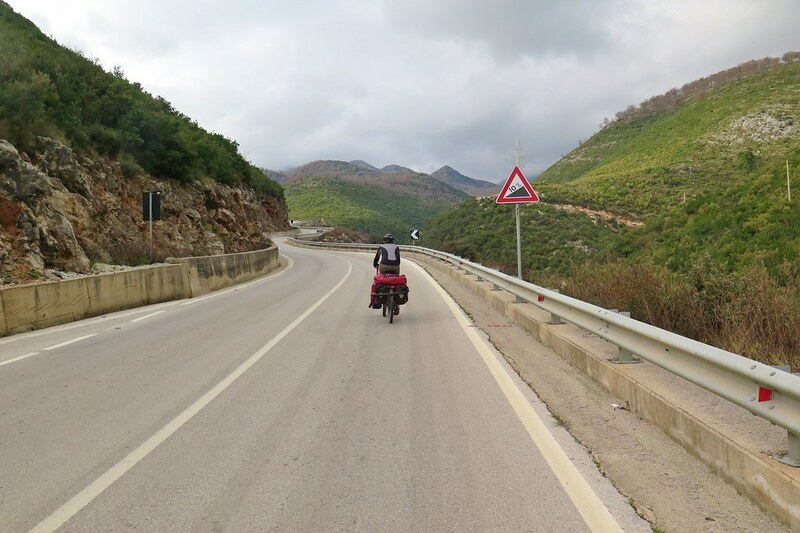 At least it was quieter and took us through some nicer areas than the main Durres – Tirana road. We reached the outskirts of the capital, then soon we were into the city where the streets were wider and smoother. 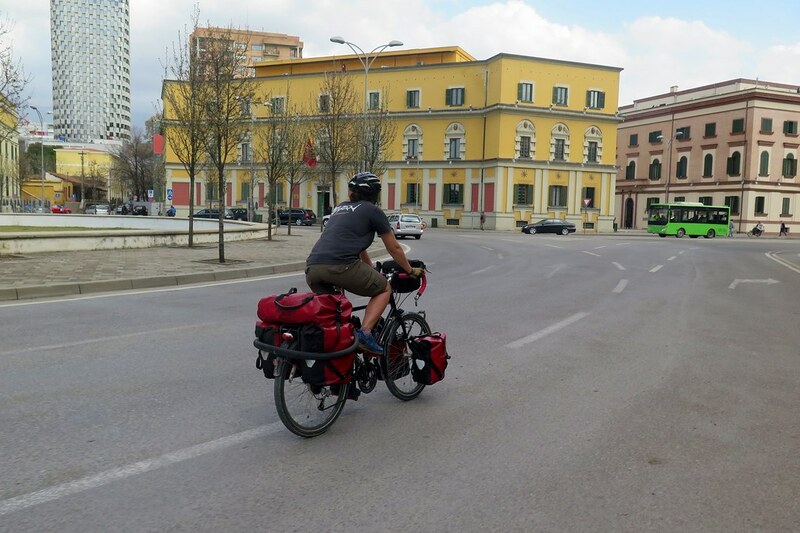 Riding into cities can often be stressful, but Tirana wasn’t too bad, it’s not a massive place. We’d booked a hotel which we found without too much trouble. Even with the failed shortcut and extra distance, we were safely in our room by early afternoon. We spent several days in the city. It was Clare’s birthday on the 2nd so we splashed out on a nice hotel and planned to go for a few good meals and do a bit of sightseeing. It’s not a beautiful city in a traditional sense, but it has it’s charms. 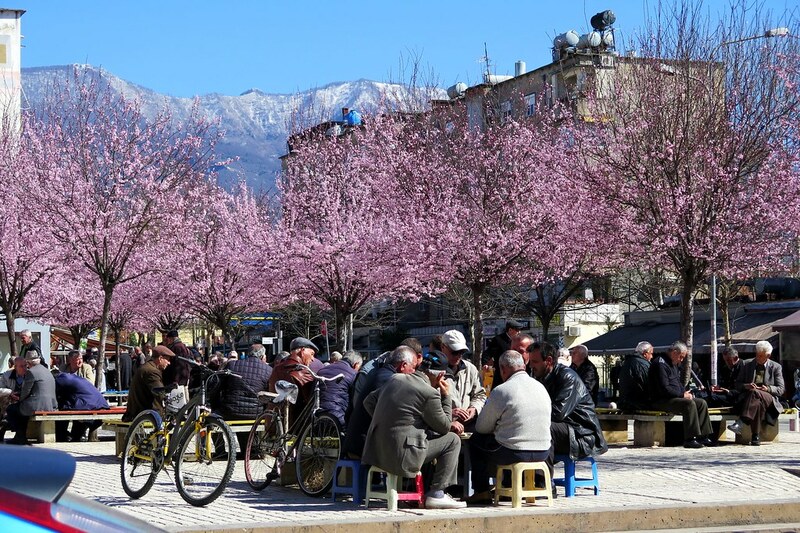 With the blossom blooming downtown and a bit of snow on the mountains, it reminded us of springtimes in Japan and the sakura in Sapporo. We really loved spending time there, wandering round and exploring. It’s developing fast and there’s clearly a lot of money floating around – the number of luxury cars parked in some areas was unbelievable. But, for now, it feels quite untouristy and the low prices of hotels and restaurants reflect that. 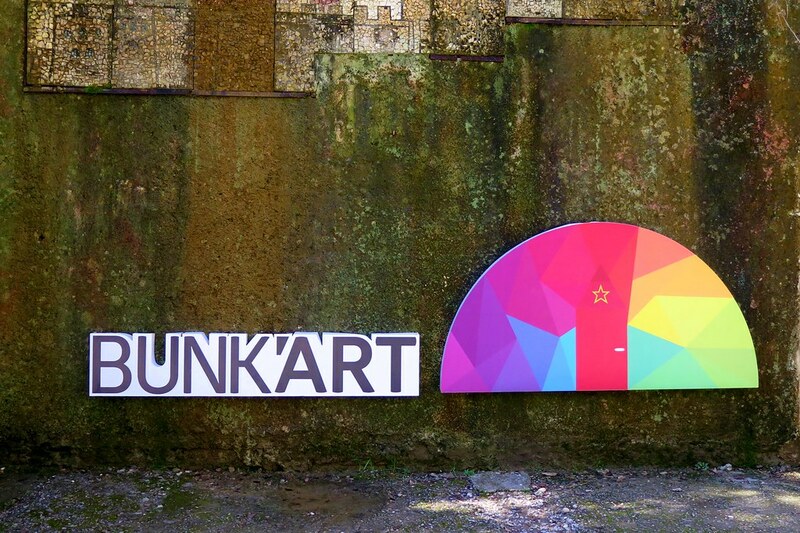 On Clare’s birthday, we visited ‘Bunkart’ a huge military bunker that has been converted into a museum and art gallery. 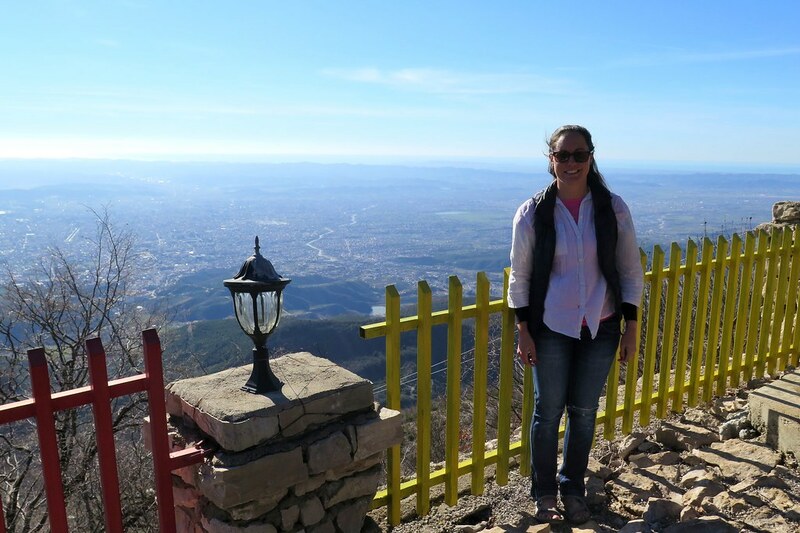 Included in the ticket price was a ride on the gondola that goes up the mountain to the East of the city. 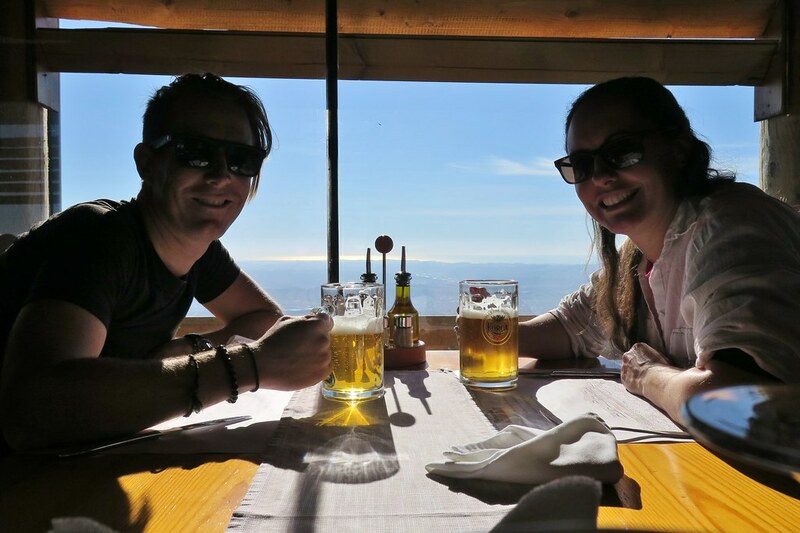 The views from on top, down over the city and out towards the sea, were spectacular, a perfect spot for a beer. 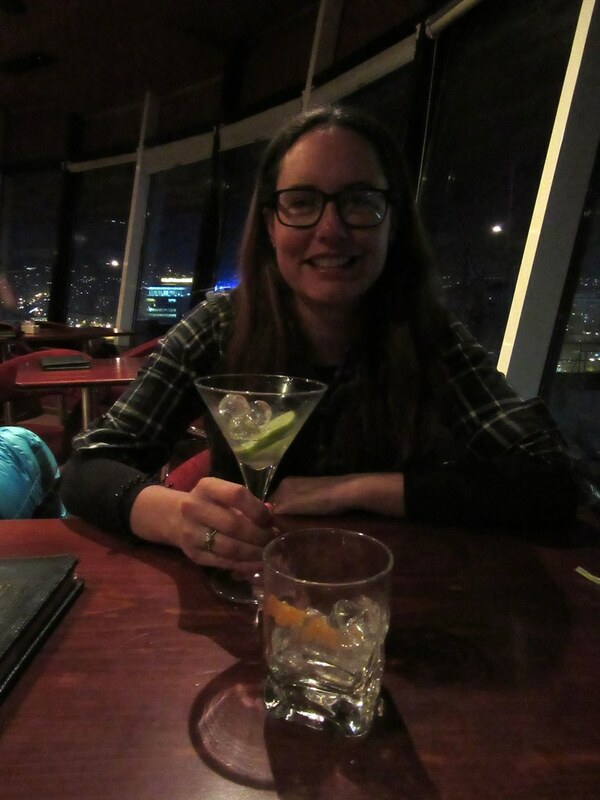 In the evening we went for cocktails in the rotating Sky Bar and then a fancy meal in Otium restaurant. 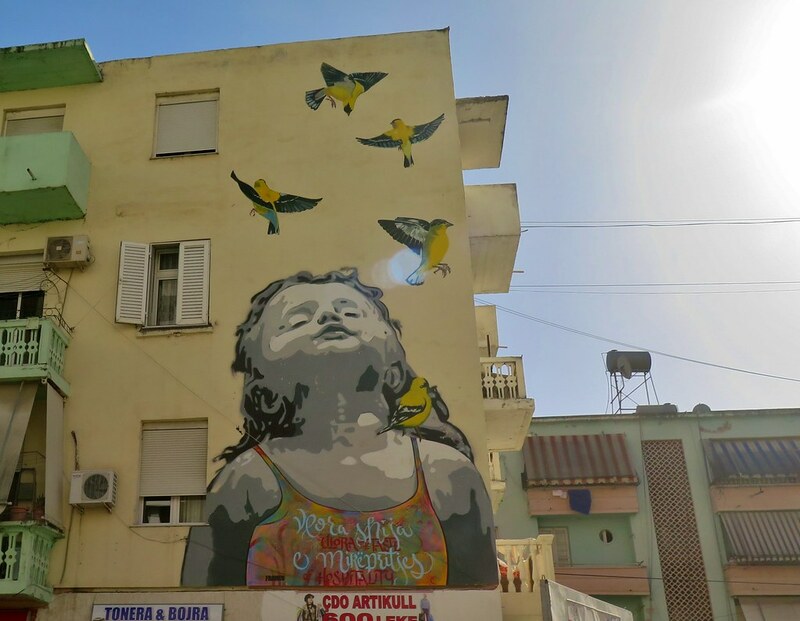 We were sad to leave Tirana, but it was time to move on. 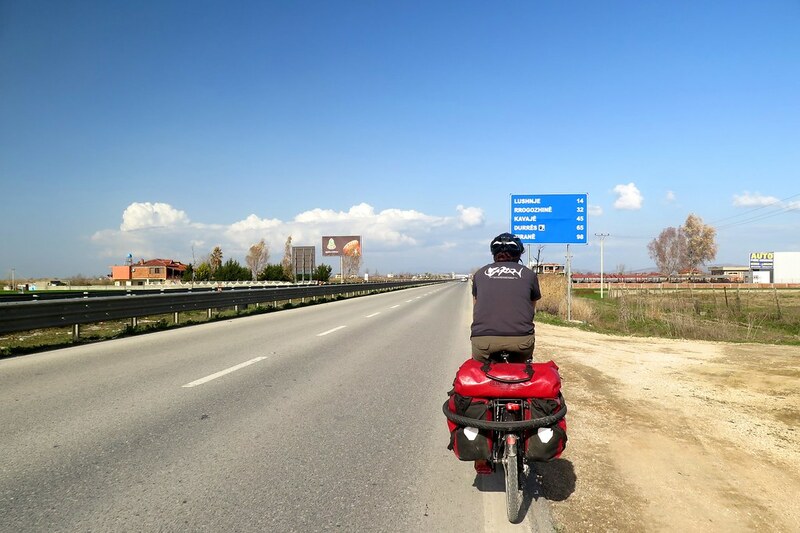 We only had 40km to ride, back to Durres, the main port city. 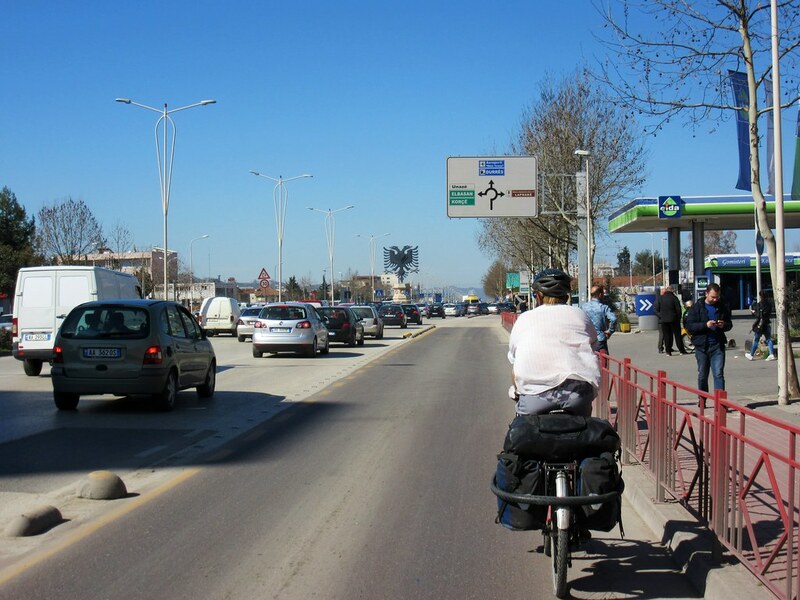 Riding out of Tirana was easy enough, we were able to follow a shared bus/bike lane out of the centre. 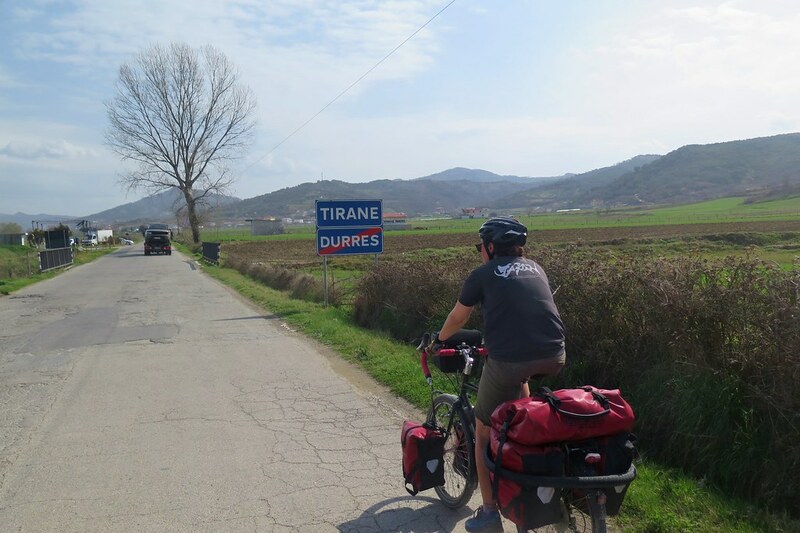 It wasn’t a particularly interesting ride – there wasn’t really a gap between the two cities, just a corridor of shops, garages and industrial units lining the highway. We made good time covering the distance in a couple of hours. First stop was the port to book tickets for the boat over the Adriatic to Bari in Southern Italy. Then it was just down the road to a hotel, probably the last time on this trip that we’ll be able to stay in somewhere for 12 Euros a night. 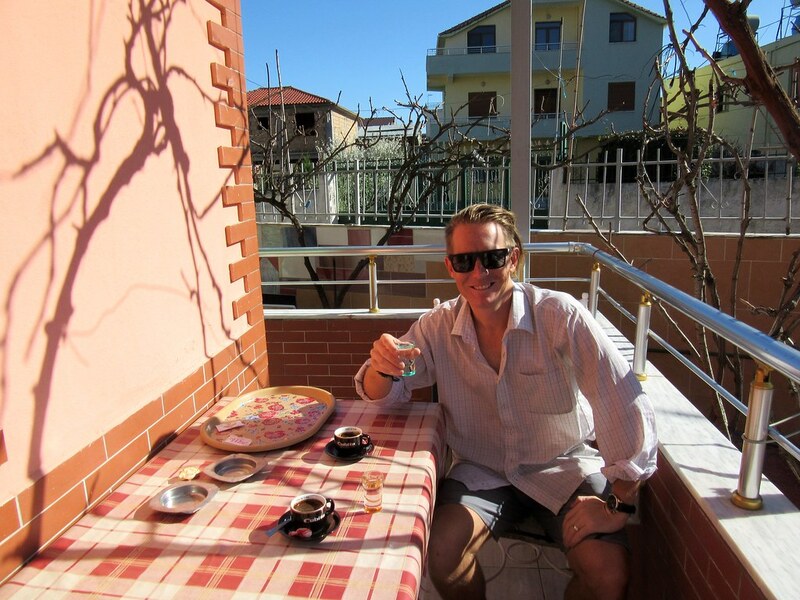 We were welcomed in with a strong coffee and an even stronger shot of Raki. 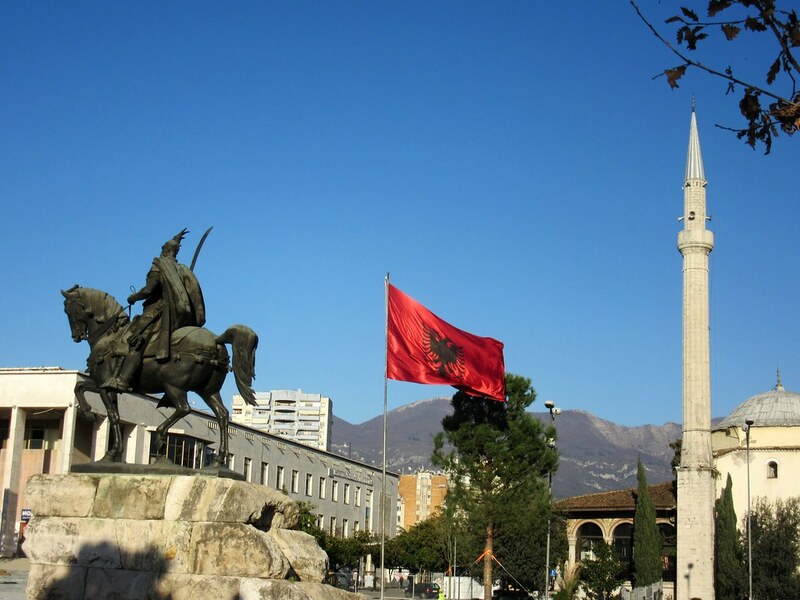 We’ll miss Albania! 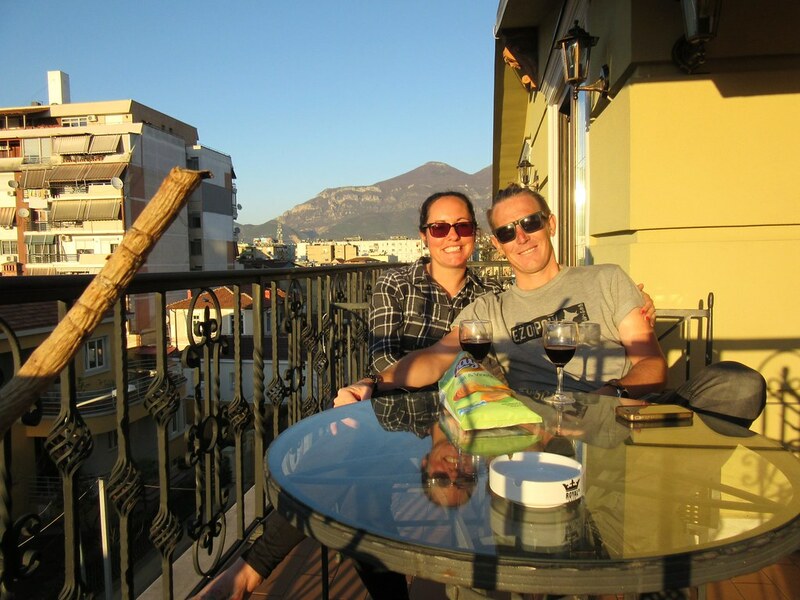 Hi Clare & Andy – just catching up with your blog and enjoying the photos. 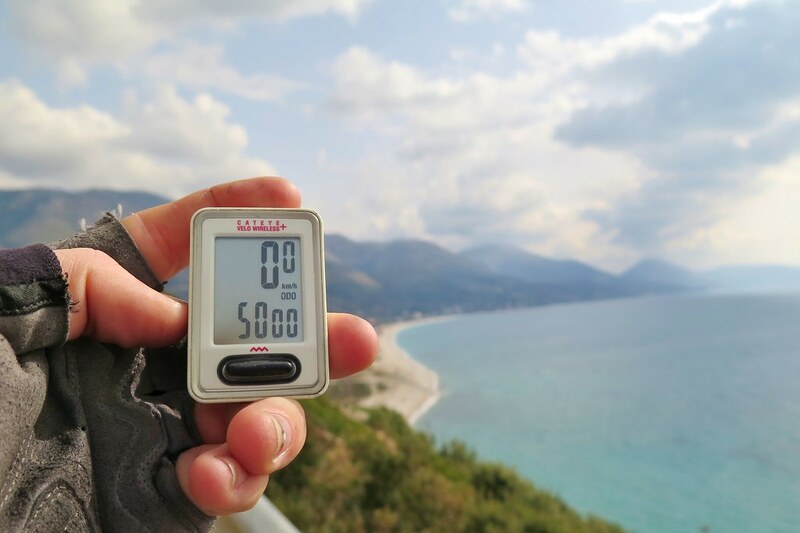 We cycled from Napoli to Bari too (then ferry to Dubrovnik). If you head south from Bari you will find beautiful Puglia!! But one place I really reccommend is the city of Matera……you can stay in a cave hotel if you wish or a little “trulli”. Sometimes we consider going to live in uglia we loved it so much…:). Not sure which way you’ll approach Napoli but of course Amalfi coast is lovely and the coast further south of there is even lovelier (and less busy). 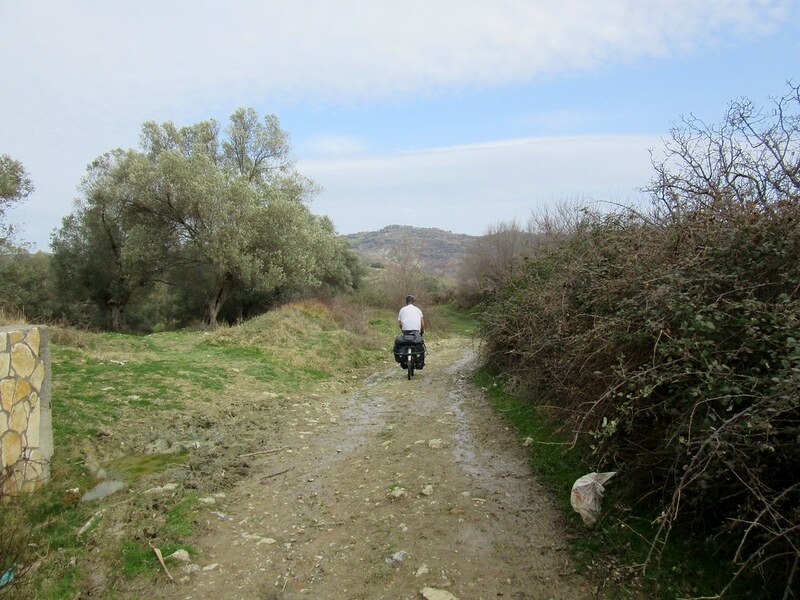 We managed to wild camp along the Amalfi coast but that wasn’t very easy!! Will you got to Sicily? You can take the ferry from Napoli. 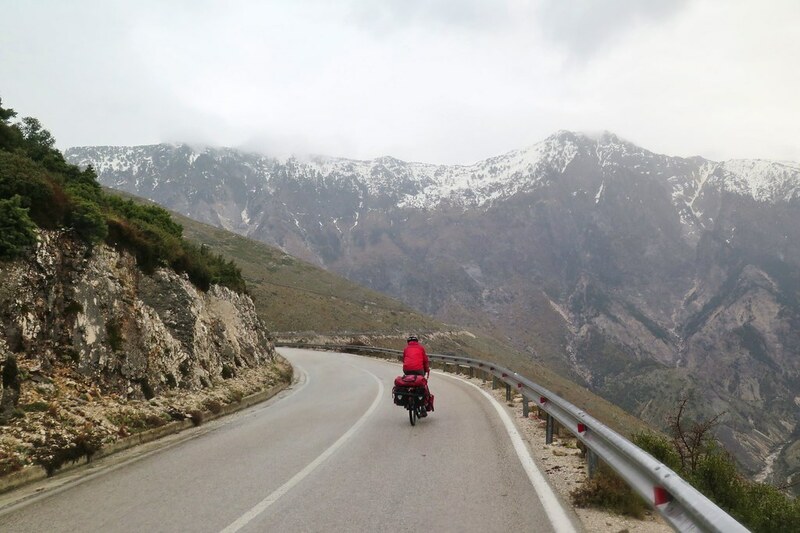 We enjoyed our route through Corsica, Sardinia and Sicily very, very much so if you fancy continuing you’re island hopping then we give this route a big thumbs-up!! Just been out on my new bike – a Surly Troll that John has built for me!!! Ciao for now and have a bellisimo time in Italy!! Grazie mille for the tips Gayle! 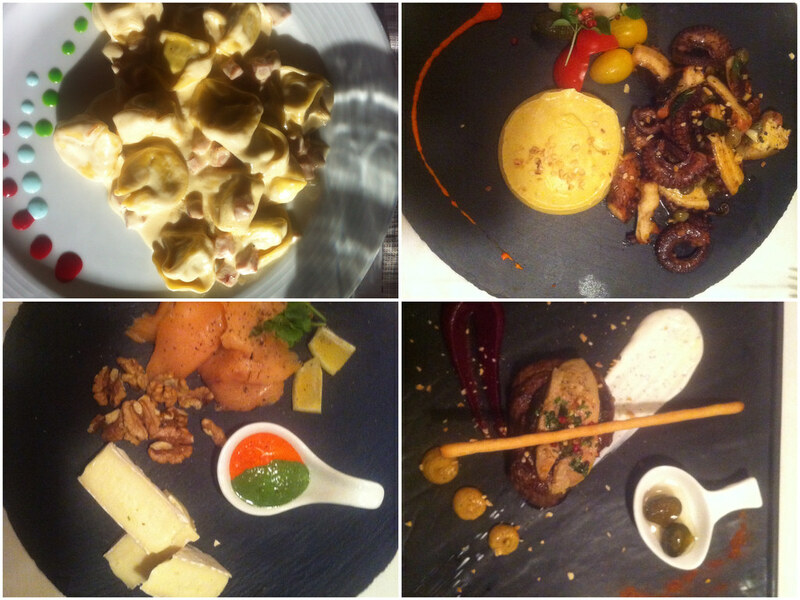 We’re not fully sure what we’ll do, but we’re really looking forward to Italy. We’ve never done the south before. 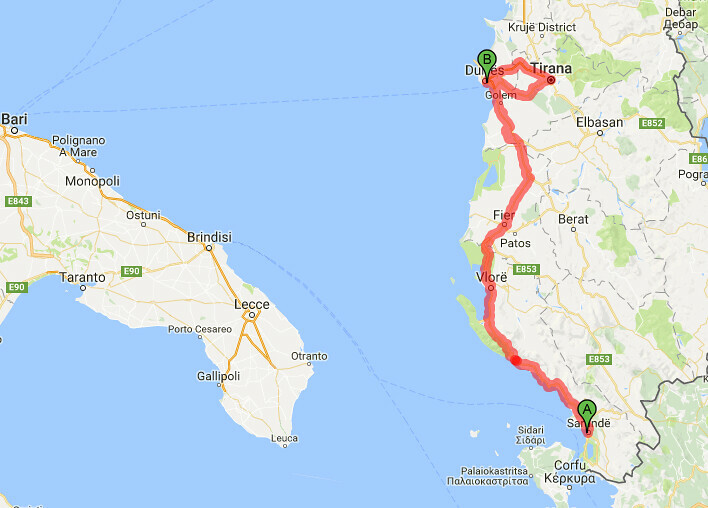 Initially we’ll be getting to Napoli fairly quickly as we’re meeting friends, but hopefully we’ll take a south-ish route to see a bit of Puglia, and hopefuly Matera! Yours is the only guess, so I reckon you’re the favourites so far! I think we’ll probably do a little less than that. It’d be nice to get over 24k though as that’s 15,000 miles. We’ll see!